A sure sign that summer is coming to an end is watching the school buses on their trial runs through towns and neighborhoods, I’m sure that a great deal of thought goes into those runs because most kids are still in bed when they come through, if not then what a rude awakening for them and a reminder that it is time to check the kids summer “bucket list” to cram in the last couple of weeks of fun in the sun. With that said in my corner of the world it is time to go for the last of the summer crops at the farm stands soon they will start bringing in the fall crops as soon as the last ear of corn is sold, summer tomatoes will be gone, but those lovely last green tomatoes will be a welcome sight in many skillets for the transition. 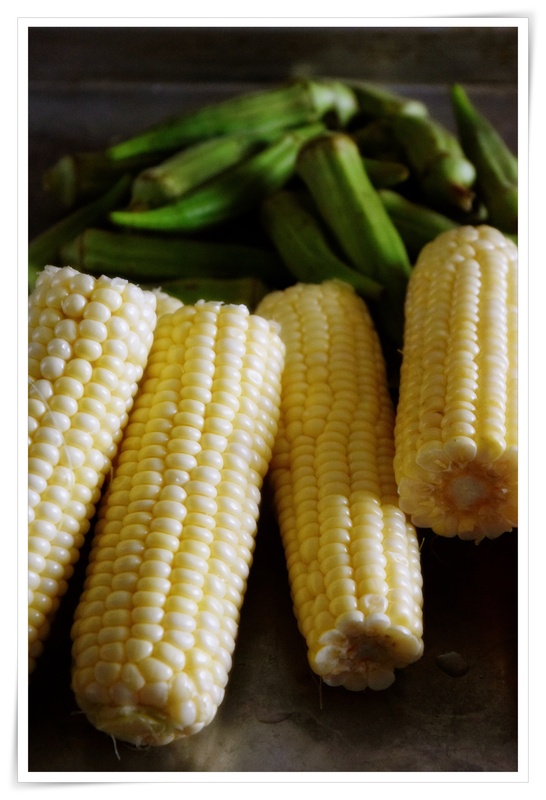 As for me a few ears of corn and some okra will be on the menu for our chicken dinner tonight. 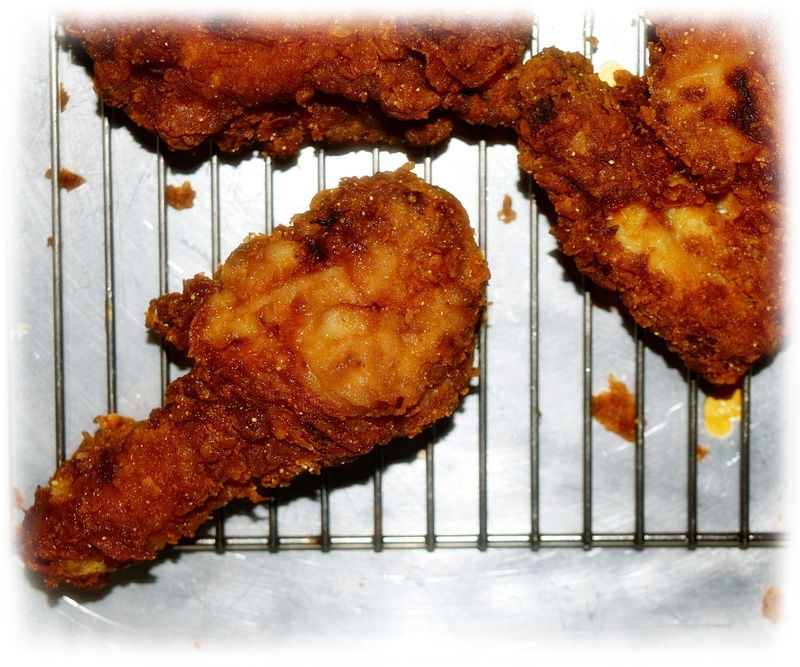 With tea and fried chicken both so very popular in the South could it get any better than combining the two for a fabulous tea brined fried chicken dinner? I’ve tea brined a few times and love the flavor and it only gets better with a buttermilk bath after brining. Chef Sean Brock’s recipe in “Heritage” is one of my favorites and while I take many liberties with his recipe it still is delicious, juicy and flavorful. I do cut back on the brining time, about 8 hours and I do a pretty good job of seasoning up the buttermilk, but you can add whatever seasonings you prefer to your buttermilk chicken bath. I use considerably less black tea, 10 tea bags and I cut the brining time to 8 hours. A good hint to cool down the brine is use half the amount of water to boil and dissolve ingredients, but after a rest add 4-6 cups of ice cubes to cool down the brine then add the chicken when the cubes have melted and brine is icy cold. I also used an electric filtered deep fryer instead of a cast iron pan…still no working vent hood! 1. Put the water in a pot and bring to a boil over high heat. Remove from the stove, add the tea bags, and let them steep for 8 minutes. 2. The recipe says to remove the teabags, I didn’t. Add the salt and sugar to the hot water and stir to dissolve them. Pour the brine into a heatproof container and cool it to room temperature, then refrigerate until completely cold. Alternately use my suggestion of half the amount of water and ice cubes. 3. Rinse the chicken with cold water. Place in the brine, cover, and refrigerate for 12 hours. After the chicken has spent 12 hours in the brine, make an ice bath in a large bowl with equal amounts of ice and water. Place the chicken in the ice bath for 5-15 minutes. (The ice will rinse away any impurities.) Remove the chicken and pat it dry. 4. Combine the buttermilk, hot sauce, and 1 tablespoon of the black pepper in a large container. Add the chicken pieces to the buttermilk mixture, cover, and let marinate for 1 hour at room temperature. 5. While the chicken is marinating, put the chicken skins in a small saucepan over very low heat, adding a small amount of water to prevent the skins from sticking and burning. Cook the skins, stirring frequently so that they don’t burn, until their fat is rendered. Strain the fat; you need 1 cup. 6. Drain the chicken, quickly rinse under cold water, and pat dry. 7. Combine the flour, cornmeal, cornstarch, garlic powder, onion powder, the remaining 1 teaspoon black pepper, the cayenne pepper, and smoked paprika in a large bowl and mix well. Add the chicken and toss to coat thoroughly. Allow it to sit for 15 minutes, then shake off any excess, transfer the chicken to a wire rack, and let sit for 15 minutes. 8. Meanwhile, put the chicken fat, lard, and canola oil in a large, deep cast-iron skillet. Add the bacon and ham and heat the fats over medium-high heat until an instant-read thermometer inserted into the fat reads 275°F. Turn the heat off and allow the bacon and ham to infuse the fats and oil for 10 minutes. 10. Turn the chicken over, cover the skillet, and cook until the pieces of chicken are the color of hay, about another 5 minutes. Remove the lid, turn the pieces again, cover, and cook the chicken until golden brown, another 3 minutes. Add the butter and continue cooking, turning the pieces once, for another 2 minutes or so on each side. The chicken should be crispy and golden brown. Let the chicken rest and drain on wire racks or on a plate covered with paper towels for about 8 minutes, but no longer. 11. Sprinkle with sea salt and serve with the gravy.